Even the most cared for horse can have performance issues from time to time. Many horses experience stiffness, problems bending, sore muscles, tail switching, a high head, and/or short strides. Many behavior problems can arise from these ailments, and without correction, the horse learns to associate pain with performance. Horses are asked to perform many different jobs for their owners. Trainers teach the horse to perform correctly, and Equine Flexion Therapy allows the horse to perform to their full potential. Without the aches and pains that muscle soreness cause, an owner can work together with their horse to achieve success. Equine Flexion Therapy is designed to access your horse's abnormal behavior, and investigate the reasons for it. Through a physical examination, stretching, and visual response, the Equine Flexion Therapist can pin point the problem area, and help alleviate the pain. Within just a few hours of massaging, stretching, and stress point targeting, your horse can be restored back to its natural optimum ability. Your horse will be able to perform without the hindrance of pain, and you will discover your horse's true potential as a result of using Equine Flexion Therapy. Learn to work on your own horse. 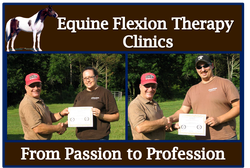 Dan Marcum offers an 8 hour class that will teach you how to perform Equine Flexion Therapy.